Can Apples Cause an Allergic Reaction? One in five Americans suffer from allergies, with about 200 people in the United States dying from food allergies each year. About 6 percent of allergy sufferers have food allergies, according to the Asthma and Allergy Foundation of America. The most common food allergies are to soy, milk, wheat, eggs, fish, shellfish, peanuts and tree nuts, but you can be allergic to other foods as well, such as plums. If you are allergic to plums, chances are you’ll develop allergies to certain other fruits, too. Plums are related to almonds, which is classified as a tree nut. Other fruits in this family include the peach, nectarine, apricot, cherry and prune plum. Plums are a genus in the rosaceae family, which includes some 400 species, according to the Pollen Library. Other tree nuts include cashews, pecans and walnuts, advises Dr. Scott H. Sicherer, researcher for the Jaffe Food Allergy Institute. If you’ve got a birch-pollen allergy, you may develop a plum allergy. 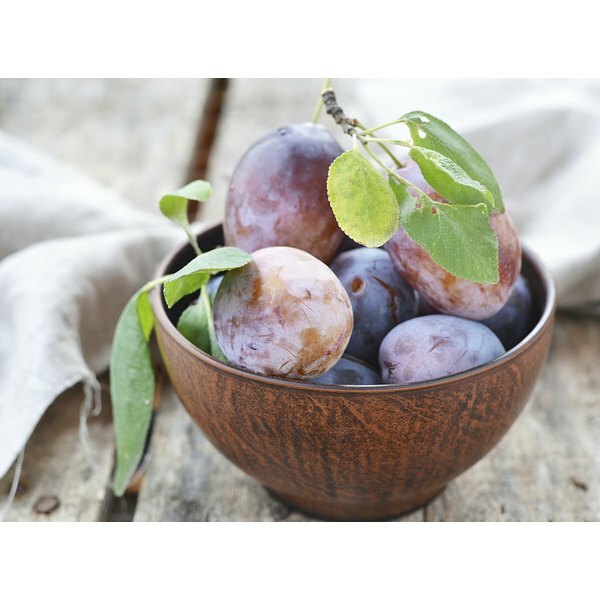 The protein in plum is similar to the protein in birch pollen that you react to. This is called the birch-fruit syndrome, according to the European Union’s InformAll Database. Symptoms may be called oral allergy syndrome (OAS) as well. These symptoms usually appear within 15 minutes of eating a raw plum. They most often include local reactions of itching and inflammation in the throat and mouth. In rare cases, OAS symptoms can be life threatening, such as anaphylaxis. An anaphylactic reaction can lead to low blood pressure, blocked airways and other symptoms, according to CNN Health. The molecule, or allergen, that causes OAS does not survive cooking. That means you’ll be able to tolerate cooked plums but not raw plums, advise the experts at InformAll. If you suffer from OAS, you may develop reactions to many other foods, says pediatric allergist Dr. Anthony Ham Pong, of Ottawa, Ontario. These include pears, apples, apricots, bananas, cherries, melons, nuts such as hazelnuts and vegetables such as celery or carrot, according to InformAll. A cross reaction often occurs with other foods due to exposure to birch pollen, advises the United Kingdom’s Dr. Flemming Andersen. You may have a different and more severe type of allergy to plums than OAS or birch-fruit syndrome. If so, you may also be allergic to peaches. Symptoms may include those of OAS along with hives, vomiting, abdominal pain and life-threatening symptoms. Life threatening reactions can include swelling of your throat, trouble breathing and anaphylaxis, Pong says. This type of reaction is likely to be more severe if you eat plums with the peel. The allergen that causes this type of reaction does survive cooking and processing, such as creation of juices, so you won’t be able to consume cooked plums, according to InformAll. You’re also likely to develop reactions to apples, apricots, cherries and nuts such as walnuts and hazelnuts if you have this type of allergy. You don’t have to consume a plum to experience either sort of reaction. Handling a raw plum, such as peeling it, can cause a rash, itching or swelling where the juice touches your skin. It also may lead to a runny nose, sneezing and watery eyes, or more severe symptoms that are life threatening, advises Pong. If you suspect you have a plum allergy, tell your doctor about your symptoms. Your doctor might have you keep a food diary or try an elimination diet. He also may conduct a blood test or prick test in which small amounts of plum and other suspected foods are put on your skin, which is then pricked with a needle, according to the Mayo Clinic. The best treatment for a plum allergy is to avoid this food. There’s no proven treatment that can prevent an allergy attack or reduce symptoms, advise the experts at the Mayo Clinic. If your allergic reactions are minor, carry antihistamines to help reduce symptoms in cases of exposure. These are not good for treating severe reactions, however. If your reaction is severe, carry an auto-injector with epinephrine at all times, or you may require a trip to the emergency room in the case of a reaction. Are Bananas Bad to Eat When You Have Rhinitis?